​​ AMARILLO – The grand opening for Cinergy Entertainment's entertainment complex is scheduled for October 2, 2018. The 90,000-sf center at 9201 Cinergy Square features 18 lanes of upscale bowling, a multilevel laser tag arena, an elevated ropes course with zip line, and a game floor with over 100 interactive games. 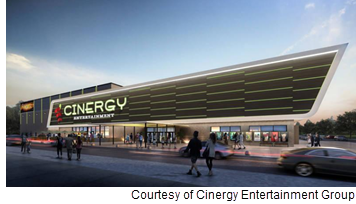 Cinergy Amarillo will provide multisensory interactive attractions and ten auditoriums with in-theater dining. This center will be the company's 4th Texas location.